I was taken on a train to Biloxi, Mississippi by my grandparents when I was nine. There they bought me an expensive oil painting set in the hotel gift shop. My love of painting and drawing was legitimized that day, and my destiny carved in stone ...I was to become a painter. ​When it came time to choose a major for college, however, my parents had other ideas. Their biggest fear was that I would end up in New Orleans, sketching pastel portraits in Jackson Square. A rather glamorous bohemian existence, I contented. ​We compromised and I became a graphic artist, which turned out pretty well, as I worked for ad agencies across the Southeast in the capacity of illustrator and art director, with a few Addy Awards to my credit as well. Then, in 1994, I moved to Atlanta to take the position of Visual Merchandising Manager for Macy's Stores. Subsequently, I launched a line of home decorative accessories carried by Neiman Marcus, Donna Karan Home, and Saks Fifth Avenue. ​But still, I painted. And by 2007, longing to uncomplicate my life and paint full-time, I relocated to Fairhope, AL, an idyllic artist colony on Mobile Bay replete with sailboats and oak trees dripping with Spanish moss. A painter's paradise. ​And, with Mother Nature as my mentor, I continue to hone my own unique nonrepresentational style of painting sky and sea, light, and the weathering and corrosive effects a coastal climate creates. And occasionally incorporating bits of type as a nod to the graphic arts. ​In life, I am intrigued by the aesthetic of contradictions, and, in my work, I explore that dichotomy. The juxtaposition of opposites creates a push/pull effect and enhances both elements; dark against light, the obscured against the revealed, delicate versus the dynamic, rough against polished, lush against the austere. I was taken on a train to Biloxi, Mississippi by my grandparents when I was nine. There they bought me an expensive oil painting set in the hotel gift shop. My love of painting and drawing was legitimized that day, and my destiny carved in stone ...I was to become a painter. ​When it came time to choose a major for college, however, my parents had other ideas. Their biggest fear was that I would end up in New Orleans, sketching pastel portraits in Jackson Square. A rather glamorous bohemian existence, I contented. ​We compromised and I became a graphic artist, which turned out pretty well, as I worked for ad agencies across the Southeast in the capacity of illustrator and art director, with a few Addy Awards to my credit as well. Then, in 1994, I moved to Atlanta to take the position of Visual Merchandising Manager for Macy's Stores. Subsequently, I launched a line of home decorative accessories carried by Neiman Marcus, Donna Karan Home, and Saks Fifth Avenue. ​But still, I painted. And by 2007, longing to uncomplicate my life and paint full-time, I relocated to Fairhope, AL, an idyllic artist colony on Mobile Bay replete with sailboats and oak trees dripping with Spanish moss. A painter's paradise. ​And, with Mother Nature as my mentor, I continue to hone my own unique nonrepresentational style of painting sky and sea, light, and the weathering and corrosive effects a coastal climate creates. And occasionally incorporating bits of type as a nod to the graphic arts. 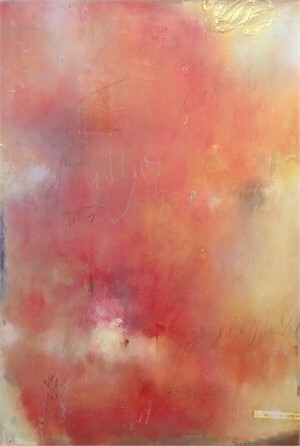 ​In life, I am intrigued by the aesthetic of contradictions, and, in my work, I explore that dichotomy. The juxtaposition of opposites creates a push/pull effect and enhances both elements; dark against light, the obscured against the revealed, delicate versus the dynamic, rough against polished, lush against the austere.